MSNBC has posted an interesting article on a Washington D.C. Bicyclist, Danny Lesh, who "stole" back his own Cannondale bike. The bicyclist found his stolen bike posted on Craiglist and called the alleged thief and asked to meet about buying the bike back. When meeting with the alleged thief, Lesh asked to take it for a test ride. Justice was then served when Lesh rode off in possession of his own bike. When the alleged thief called to complain, Lesh simply told him that he was out of luck. You can find the MSNBC article here. Chicago bicyclists will recognize a very familiar t-shirt that Lesh is riding in the photo and video accompanying the article. Keating Law Offices does not handle cases involving stolen bicycles. If you bicycle has been stolen you should contact your local police department and report it missing. 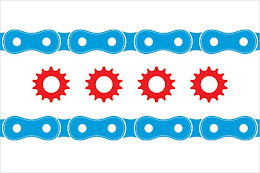 You should also list your stolen bike with the Chicago Stolen Bike Registry.